- Using alkaline hair cleansing products can cause breakage and damage to the hair shaft, exposing hair to bacteria. If you are as much a beauty nerd as we are, please read on to find out more! Now let's take a step back into our chemistry class. pH (power of hydrogen) is the measure of acidity and alkalinity of a mixture. 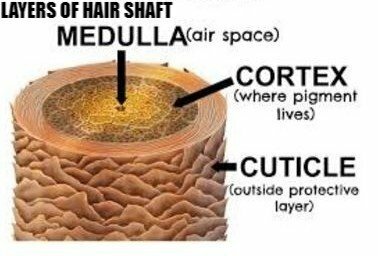 Your hair shaft consists of scale-like cuticles that protect a sensitive interior cortex. This cortex keeps moisture and natural oils within, which is what gives your hair that flexibility and shine! Maintaining a healthy pH level will help protect your hair from all those nasties (read: bacteria and fungus eww) by sealing the hair’s cuticles to retain moisture and sebum. Would you like us to get specific? The scalp pH is 5.5, and the hair shaft pH is 3.67. When you expose your hair to alkaline products( pH levels above 7), it can cause the cuticles to open up and lose its protection against the external environment - leading to breakage and split ends. If you have problems with fungi or bacteria on your scalp, it is likely that your scalp and hair are too alkali. This means that you are using a product that has a high pH above 7, and it is stripping away your naturally acidic sebum that fights bacteria. Many common hair products and treatments fall on the alkaline spectrum. Hair dye usually falls between 8-9 and relaxers between 13-14, severely damaging the hair. Overall, the best pH level for hair is about 5. At this level, the hair is slightly acidic. To avoid disruption to your hair's natural balance, the optimum PH level for your hair cleansing products is between 5-7 with water being neutral at 7. Fear not, we have come prepared with some tips..
A pH-balanced shampoo can help you keep your hair dye looking fresher longer. The cells that give your hair its color reside in the cortex of your hair. When you colour dye your hair, you have to open the cuticle to get to the colour-containing cells. Once the colour has been changed, you want to close the cuticle to seal the new shades inside, keeping it vibrant and longer lasting. If you have oily hair, use 1-2 tablespoons of diluted apple cider vinegar (pH 4) to bring your hair into the normal pH range. You can put this into a spray bottle for easy application, but do remember to store it in the fridge to keep it fresh! Alternatively, you can use pure aloe vera juice! Choose a shampoo with a lower pH (closer to 5) will help to maintain your hair's moisture and flexibility. You should also use an organic hair oil to further nourish and close up your cuticles. Remember to always choose sulfate and silicone-free products. The build-up of these substances will gradually weigh down on your hair, weakening the shaft and causing pre-mature breakage. It can make your hair look and feel shiny right now, but it will cause more harm than good in the long run. Greasy hair? Why you shouldn’t give up on your solid shampoo yet!